In her short film, ‘Whomade’, artist Shirley Chubb considers how landscape forms the basis of our existence & how communities are defined by their ability to use & process the produce of the world around them. 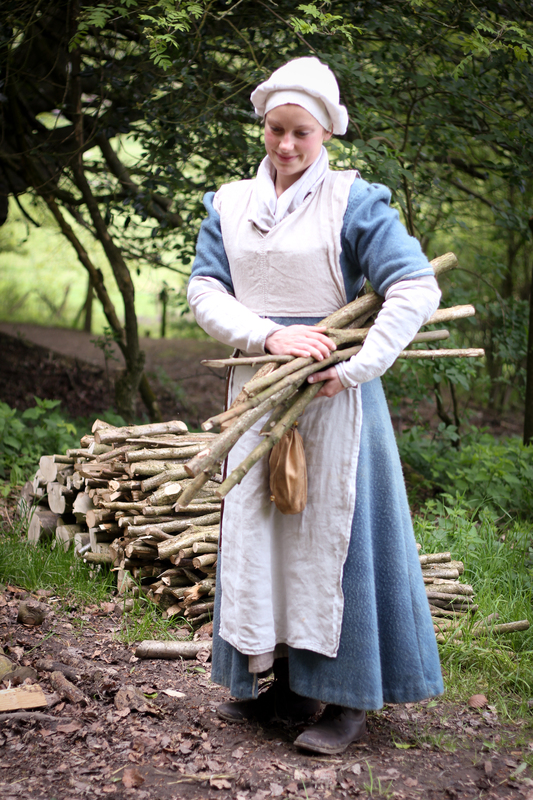 When visiting the Weald & Downland Open Air Museum Shirley was able to see first hand the ancient process of preparing flax & wool into yarns for weaving. She was fascinated by the extraordinary nature of transforming these materials into clothing that warms, protects & identifies us. Shirley was also intrigued by the phonetic spelling of ‘homemade’ in the 1661 probate inventory of Sussex mercer, Walter Deane – ‘Item 1 yard 1/2 of dyed whomade cloth at 3s per yard’ – which suggests both the anonymity of the weaver as well as the connection between the cloth & the locality (‘homemade’ seems to have been a generic term used to describe a locally-produced but professionally-woven cloth). The film that she produced reflects these various elements with the triptych format simultaneously showing us how making processes reflect the movement & the motion of the world around us. The linear motion also reminds us of the borders & edges that define our environments &, taken from film recorded in Sussex & Scotland, suggests the connective reach of the fundamental processes of spinning & weaving. The exhibition, ‘Narrative Cloth’ is the result of a collaboration between social historian, Danae Tankard, & three artists, Victoria Brown, Shirley Chubb & Rachel Johnston. The starting point has been Danae’s research on the clothing of the rural poor in 17th century Sussex which was published as an article, ‘”A pair of grass-green woollen stockings”: the clothing of the rural poor in seventeenth-century Sussex’, in the journal, Textile History, in 2012. This research drew on a diverse range of primary sources, including theft prosecutions, wills & probate inventories (lists of testators’ moveable goods taken immediately after death). Each artist has produced a series of works in different media reflecting their personal response to the narratives of cloth & clothing explored in the article. In her short film, Whomade, Shirley Chubb considers how landscape forms the basis of our existence and how communities are defined by their ability to use and process the produce of the world around us. 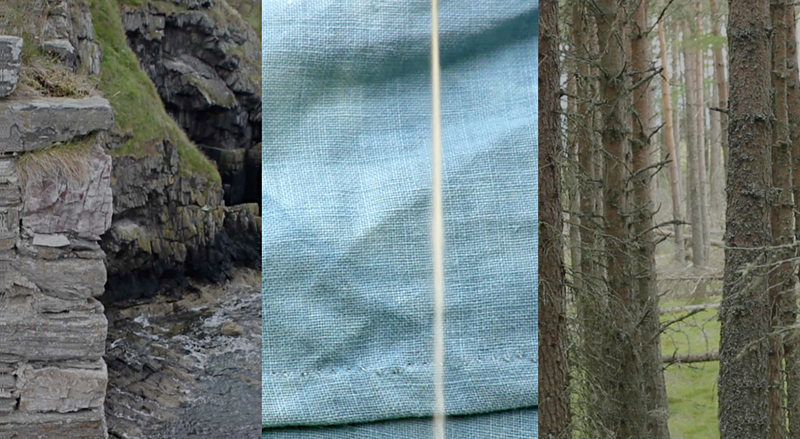 The split screen format of her film includes closely observed footage of flax and wool being prepared for use. Another section shows how a caught strand of wool is being spun by the wind. Flanked by film of edges and lines in the landscape we see how spinning and weaving are echoed in the movement and motion of the world around us. Victoria Brown’s work is about colour; she compares & contrasts chemical & natural dyes through making her own ‘visual list’ of colours, with dyes used 450 years ago & modern chemical equivalents. 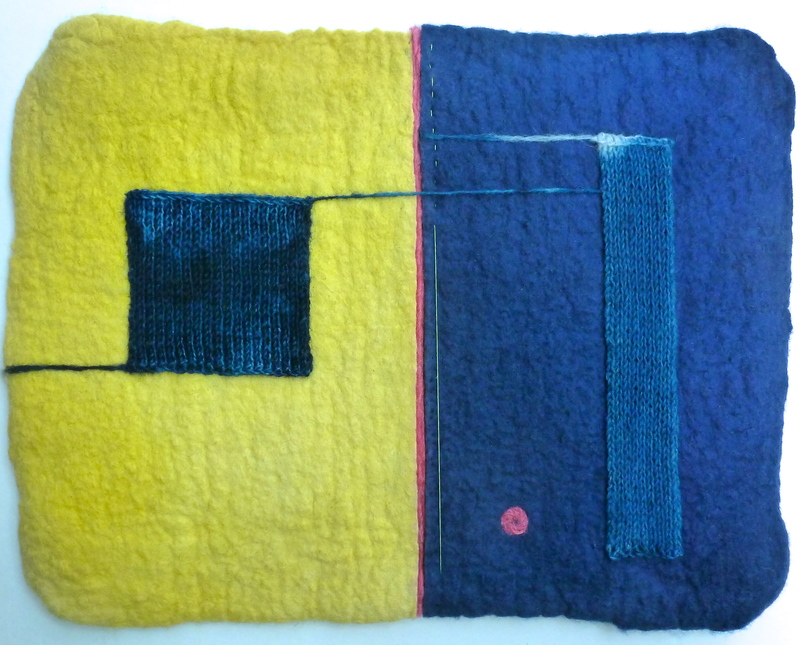 She made pieces of felt from 100 grams of wool & used 17th century plant dyes; woad for blue, weld for yellow, madder for red & 21st century ‘Acid Dyes’; Kanacid Red 4B, Lanaset Blue & Kananthrol Yellow to colour the fabric. Rachel Johnston responded to the story of a woman called Elizabeth Coulstocke indicted for the theft of one & three quarter pounds of wool in 1651. She was interested in the story that lay behind the facts & figures. She began by spinning one & three quarter pounds of wool with a drop spindle. The intensely tactile nature of spinning brought a focus to the hands &, making a connection of clothing, gloves. The project is funded by the University of Chichester. From Monday 21 September to Sunday 27 September we will be holding an exhibition of new contemporary artworks by three artists from the Department of Fine Art, University of Chichester, Rachel Johnston, Victoria Brown and Shirley Chubb. The artworks have been inspired by the Museum’s Historic Clothing Project as well as a range of documentary sources used by the Museum’s social historian, Danae Tankard, to investigate 17th century provincial clothing. The artists have each responded to the idea of narrative in these documentary sources – in other words, the stories the documents reveal about clothes and their wearers. ‘about 2 years since she bought 5lb of wool of goodwife Earle, 2 1/2lb of Thomas Styan & 3lb she had of her own, all of which she spun herself into woollen yarn & about 12 months since she dyed about 1 1/2lb of the said wool (before it was spun) of a green & tawny colour & that she did … since put the said 1 1/2lb of mingled yarn & also 10lb of white yarn to John English to weave into linsey-woolsey, the dyed yarn to be made up in one end of the piece & that she intended to make her a waistcoat of that piece & further says that she dyed both the colours in one way & that she bought the material where with she dyed it of the wife of John Buckall of Ditchling‘ (East Sussex Record Office, QR/E91). Rachel was curious about the accusation & the story of the thief. In this story, as in other court records, specific weights & measures were an essential starting point in determining the sequence of events & guilt of the individual on trial, highlighting the high value placed on cloth & clothing. Rachel began to wonder about Elizabeth – what lay behind the facts & figures? Did the alleged theft weigh heavily on her conscience? Was she struggling to make a living? Was she blithely dismissive of the accusation? A new set of narratives is suggested with a range of personal & social consequences. 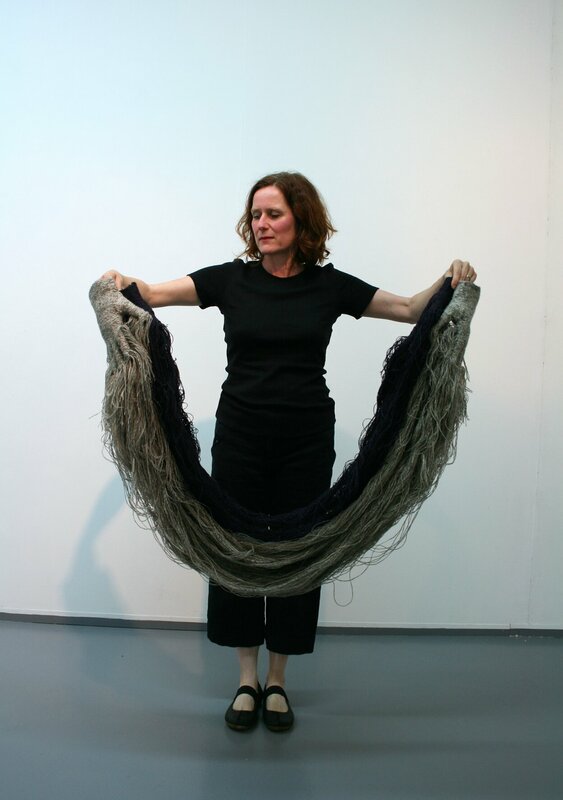 In considering the kinds of human experience that might connect past & present, Rachel began with the process of making. She span one & three quarter pounds of wool using a drop spindle, reflecting upon the intense labour & time required in the creation of cloth. 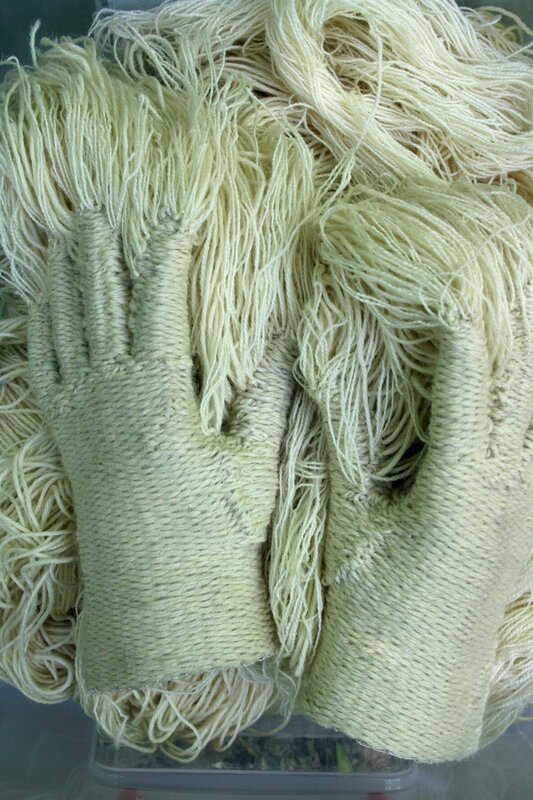 The labour & tactile immediacy of spinning brings a focus to the hands. From this came the making of a series of textile gloves, some felt & some woven, each pair or set weighing one and three quarter pounds, alluding to the case of Elizabeth Coulstocke. 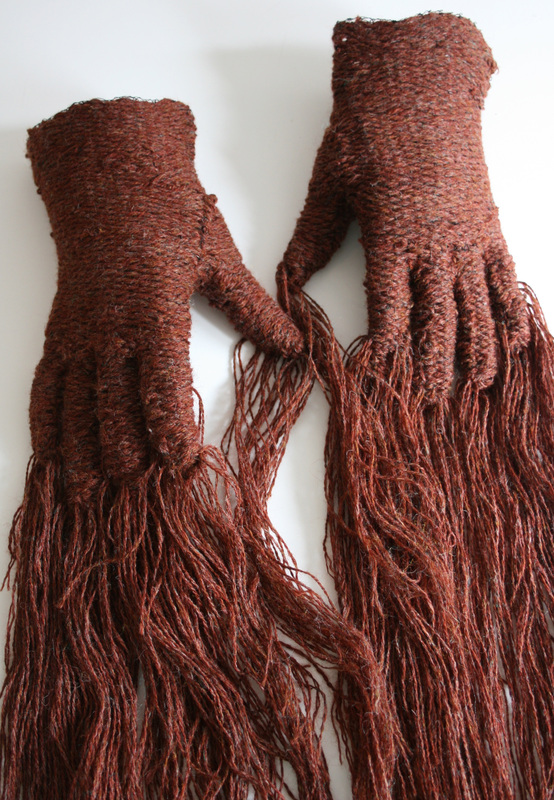 The gloves have been worn & as they are worn they have become shaped, assuming an identity that connects wearer & place or wearers with each other, suggesting new narratives. The Narrative Cloth exhibition will be open from 11am to 5pm from Monday 21 September to Saturday 26 September & from 11am to 6pm on Sunday 27 September. Entry is included in the regular Museum admission price. On Sunday 27 September we are also holding our Historic Clothing Day, a day of talks on aspects of clothing history from c1500 to c1900. Click on the link to find out more. 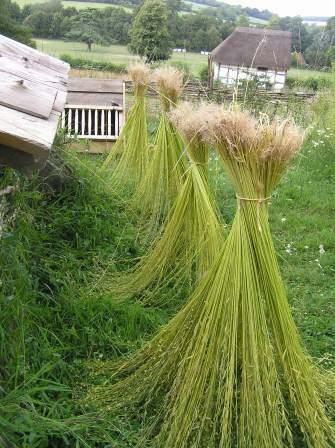 We have recently harvested our flax crop which was planted in April in the garden behind Tindalls Cottage. The flax is harvested by being pulled directly from the ground which preserves the length of its fibres. 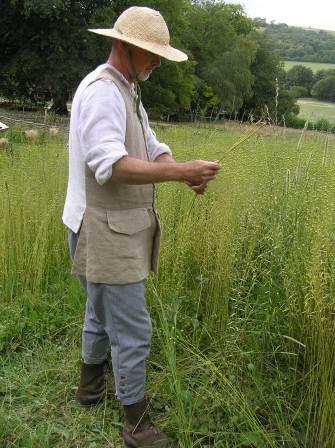 Here the flax is being harvested by a male interpreter but historically this was an activity undertaken by women. Once harvested, the stalks are soaked in water to start the breakdown of the woody part of the plant so it separates more easily from the fibres, a process known as ‘retting’. This can take several weeks to complete, depending on the weather conditions and the growing conditions of the plants. Once retted, the flax is dried thoroughly before storage. When the flax is dry and brittle, the woody parts of the plant are broken into smaller wooden splinters on a breaker, using a chopping motion. These woody splinters are then brushed away using a flax knife or a flax beater, a tool that is shaped like a very large wooden knife. As well as clearing away the woody shards, this also starts to soften the fibres, removes some of the unwanted waste matter and straightens the long fibres. The fibres are then ‘dressed’ or heckled, which involves drawing the fibres through a set of pointed iron spikes set into a wooden board, followed by further beating and combing on wood carders. Flax breaking and dressing were specialist processes undertaken by men. The processed fibre is then ready for spinning, a task undertaken by women. Women were paid by the spun pound, the rate varying depending on the quality of the fibre. A married woman could spin about a pound of linen yarn a day. Spun yarn was then sent to the weaver to be woven into cloth. Finally, it was ‘whited’ or bleached which involved soaking it in lye and ashes before spreading it out on the grass to dry. Linen cloth was used within the home as bedding (sheets and pillowcases), table cloths, napkins and towelling. It was worn as underclothing (smocks and shirts), aprons, head and neck cloths. It was also used for storage (sacking) and packaging. At the Museum linen yarn is plaited to make string which is used in our houses and historic gardens. This piece of embroidered cloth was found during the dismantling of the house extension from Reigate in 1981, re-erected at the museum in 1987. The extension, containing a basement, ground-floor room, first-floor room, and attic, was originally attached to the rear of No. 43 High Street in Reigate (Surrey). No. 43 High Street dated from the early 20th century but fragments of earlier timbers suggested that its medieval predecessor had a rear staircase tower to which the extension had been attached sometime around 1620. 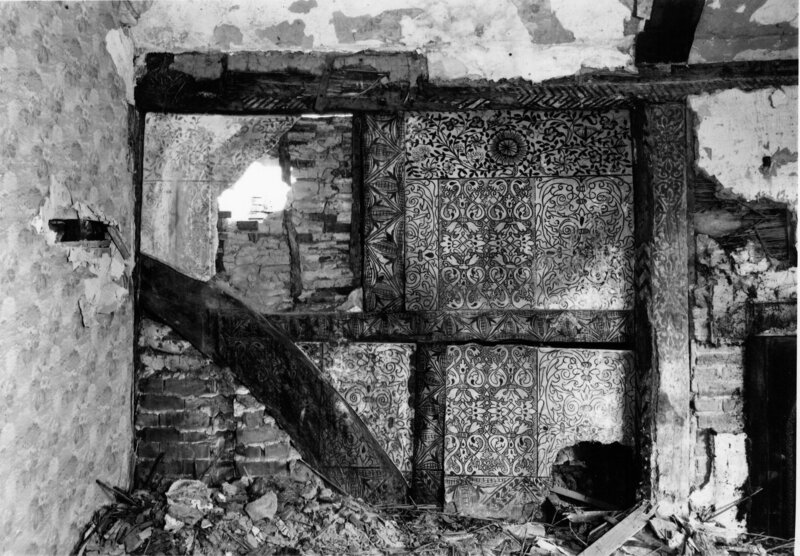 The clothing fragment – most likely part of a sleeve – appears to have been deliberately concealed in a partition between the building eaves and the attic floor. 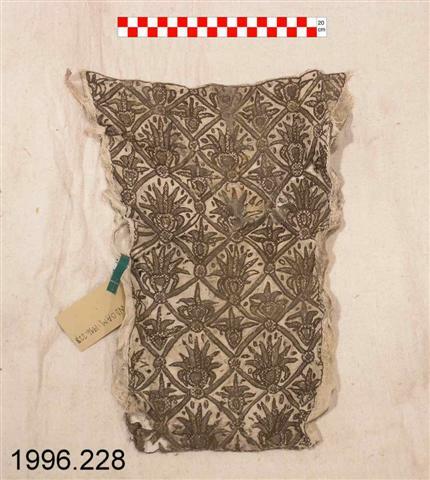 The material is linen with an elaborate floral embroidered design worked in black silk and silver and silver gilt thread. It is thought to date from about 1580 and is an example of ‘blackwork’, a style of needlework popular in England in the late 16th and early 17th centuries. The design would have been drawn onto the linen with pen and ink. This style of embroidery bears a striking resemblance to contemporary wall paintings. Those discovered in the upper room of the Reigate extension consisted of curvilinear black-on-white designs as well as brightly coloured foliage. A more obvious comparison can be made with the so-called Fittleworth panels in the museum’s collection which were removed from a house in Fittleworth (West Sussex) in 1968 to prevent their complete destruction. They were uncovered beneath layers of reed plaster whilst the house was being renovated and the house’s owner had no interest in preserving them in situ. 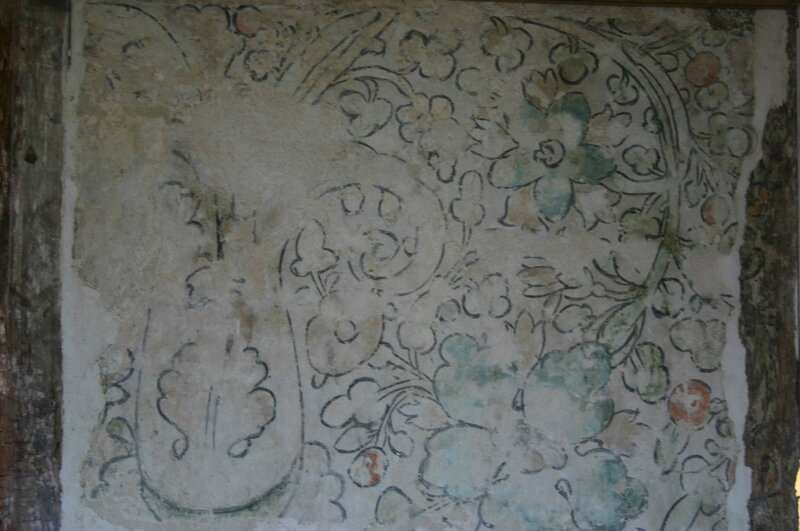 Like the sleeve fragment the paintings are thought to date from about 1580. The practice of deliberately concealing garments and other objects within a building’s fabric is now well documented with examples from the 15th century to the early 20th century in various parts of Britain. They are most commonly found in or near chimneys or fireplaces, under the floor, above the ceiling or within walls, frequently near the junctions of old and new parts of the building. There are no contemporary explanations of why objects were concealed in this way but historians and archaeologists generally interpret these practices as a form of ritual behaviour, intended to protect the occupants from some kind of malevolent external force. To find out more visit the website of the Deliberately Concealed Garments Project. 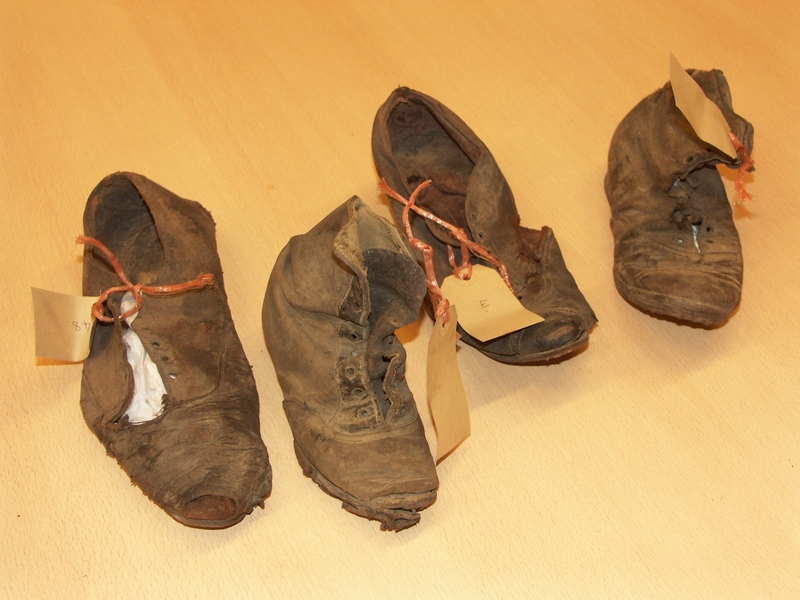 The museum has other examples of deliberately concealed objects, the most significant of which is the collection of around 80 shoes and boots, all dating from the late 19th and early 20th centuries, found in a space next to the chimney on the ground floor of a house in Nutley (East Sussex). Some of these objects will be on display at the museum from 10 to 12 July 2015 as part of the Festival of Archaeology. Some of the replica clothing made by the Needlework Group will be on display here at the Museum from Sunday 15 to Friday 20 March 2015. The exhibition, in Crawley Hall, will be open daily from 11.00 to 16.00. Entry is included in the normal Museum admission price. The exhibition will include Medieval, Tudor, Stuart, Georgian and Victorian clothing. Staff and volunteers will be on hand to answer questions. Visitors will be encouraged to try some of the clothing on (optional, not compulsory!). The Historic Clothing Project closed at the end of 2014. It was originally only intended to run for four years but the generosity of the Museum’s Friends organisation allowed it to continue for a further three years. The skills that the members of the Needlework Group learned will be retained in an on-going programme of clothing repair and maintenance and many of them will continue to be involved with the Project through Museum demonstrations and exhibitions. We will continue to offer specialist talks both on and off site as well as temporary exhibitions on site. The next exhibition featuring the work of the Historic Clothing Project will run from 15 to 20 March 2015. On September 27 2015 we will be holding a Historic Clothing Day with a number of specialist speakers. The work of the Museum’s Historic Clothing Project will be on display together with a series of new contemporary art works that it has inspired, created by three artists from the Department of Fine Art at the University of Chichester.